In January, we bought a Sprinter to build into a camper van. Picking and buying a van was a tricky process but eventually we landed on this blue beauty from the land of ten thousand lakes! We looked at smaller panel vans like Ford E350 or the Chevy Express. These vans were cheaper, but we ultimately decided that they were just too small for two people and two bikes. With no headroom to stand up, we probably wouldn't be able to have a full, comfortable kitchen set up. Any money we saved on the van would likely get quickly "eaten away" by eating out frequently rather than cooking. Pre-converted vans, like the GMC Savanna had the same issue of headroom and lack of living space. Besides many of them didn’t have the features, like bike storage, or the cozy cabin feel that we wanted. We thought that some of the newer work vans that have arrived on the American market in the last few years, like the Ford Transit or the Dodge ProMaster would be great. We thought they might be a little easier to work on mechanically since they wouldn’t have the Euro-quirks and unique parts that are present in the Sprinter (manufactured by Mercedes). However, with both these being so new, they were all out of our price range unless there was something majorly wrong with them. We considered a school bus or an airport shuttle. We even briefly thought about a box truck. Long school buses were out and passenger vehicles above 15-person capacity were out because neither of us was willing to get our CDL. Eventually we decided that even a small shuttle bus was just way too big to handle mountain switchbacks or gravel forest roads comfortably. Eventually we landed on the Sprinter, which may be the most common van for self-converted camper vans or tiny homes. It has been on the market in the US and Europe for a long time. Some mechanics say that it is the most reliable diesel van in the world. All Sprinters are produced by Mercedes, but it’s rebadged and sold by Dodge and Freightliner as well. The Sprinter comes in a few different specs. You can get it with a 144” or 170” wheelbase, with a low or a high roof, and in different payloads (the 2500 or the 3500 dualy). Mercedes even makes a 4x4 Sprinter now. A 4x4 would have been amazing, but it’s a feature that’s really only available on the newer, more expensive vehicles. In 2008, Mercedes updated the Sprinter. Post-2007 vehicles can easily be identified by their sportier, less commercial vehicle look. Unfortunately the newer version of the Sprinter also has a number of common mechanical issues that never plagued the earlier version of the Sprinter. To narrow our search a bit, we decided on a wish list for our ideal van, with the understanding that we probably wouldn’t get every item on the list. We wanted a 170” wheelbase and a high roof. We were pretty willing to compromise on the length, but we really wanted the high roof. We were hoping for the lighter payload, because we didn’t want to lose the space to the extra rear wheel on the dualy. We never were going to be hauling something super heavy so the extra payload wasn’t necessary, although that’s definitely something we would have compromised on if we had found a great van that was a dualy. We knew we needed a vehicle that had been taken care of and was still mechanically sound. Because of the injector issue and the emissions issues that were introduced in the post-2007 vehicles, our ideal van was a 2007 version or earlier. Rust is a big issue in Sprinters, so we were also wanted a vehicle that didn’t have too much rust on the body. When shopping for Sprinters, we saw some that had over 700,000 miles on them. Diesel vehicles commonly run to a much higher mileage than gas vehicles. With that in mind we were looking for a van that had between 100,000 and 200,000 miles. Craigslist ended up being the easiest site to use for shopping for the van. Private individuals post their vans on there, but used car dealers also commonly use it as well. 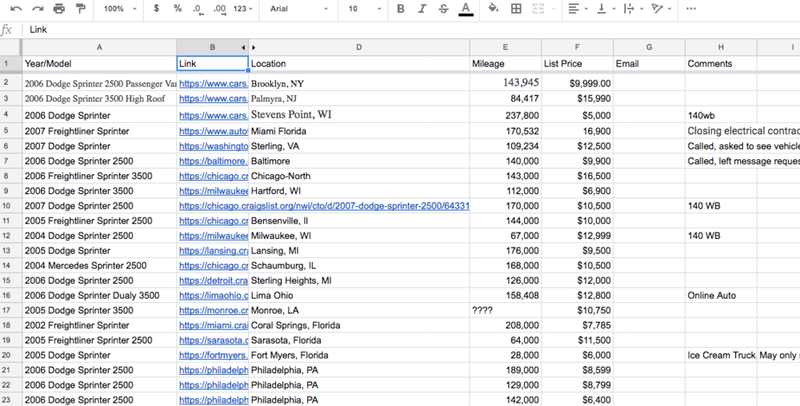 We started a lengthy spreadsheet of different vans, listing the features of each van, the cost, its location, its mileage, etc. This kept us a bit more organized during our search. A detailed spreadsheet listing all of the vans we were considering was really helpful when we were van shopping--especially since there were two people searching. Van shopping entailed hours of scouring Craigslist and other car dealer websites to find our almost perfect van. Although we were living in Washington, DC at the time, after the local search turned up fruitless, we took our search nationwide. We looked in places on the Eastern Seaboard that we could drive to, in southern states where rust wouldn’t be such an issue, and in places where we had family or friends. After checking out a few duds locally and in New Jersey and communicating with sellers about vans in a lot of other states, we finally found a very promising van in Minneapolis, Minnesota. It was a 2008 Dodge Sprinter, with a high roof, and the longer wheelbase. It had some rust, but overall it seemed like it was in good shape. It was painted a lovely royal blue as well, which was definitely a bonus. Ian talked with the dealership quite a bit in advance of flying to Minneapolis, and they even replaced a wheel bearing prior to his arrival. The guys we worked with at the dealership seemed pretty honest and “Minnesota Nice,” and they held the van without a deposit while Ian flew out there. After test driving the van and seeing the records that the van had been serviced every 10,000 miles, Ian, who is pretty mechanically knowledgeable, could see that the van had been taken care of by its previous owner. Our sole hesitation was the amount of rust on the body of the van. Knowing that any van we bought would require some compromise from our wish list, we decided to buy the van! Poor Ian had to drive the van back from Minnesota in the middle of a horrible snow storm. Fortunately he made it. He left Dulles International by plane at 5am one day and was back with our new home on wheels by close of business the next. Over the following two days, Ian drove the van back to Virginia where were living at the time we bought it. He drove through the night on terrible roads, but finally he made it home. He even picked me up from the metro station after work in the blue behemoth the day he brought it home. Since the van was giant and blue, we dubbed it “Violet Beauregarde,” after the character in Charlie and the Chocolate Factory, who eats some undeveloped chewing gum in Willy Wonka’s factory and turns into a giant blueberry. The moniker is especially appropriate, because Ian went from scooting around in DC traffic in a small blue Mini Cooper to driving a 14-foot blue Sprinter. Violet Beauregarde, or Violet B. for short, is a 2008 Dodge Sprinter, with about 130,000 miles. The van has a high roof so both Ian and I can stand up, and it’s the 170” wheel base, so we will have plenty of space for a full size bed and a pretty big kitchen area. The van only had one owner, an electrician. It was serviced every 10,000 miles at the dealership where it was purchased new, which is the same dealership where we bought it used. The body did have a fair amount of rust, but we are removing and covering the rust ourselves (see our article, Rust Abatement.) Inside, the van had a plywood floor installed in it, which we plan to use in the build as a subfloor. It also had a bunch of plastic paneling that we will remove. It was nice to start with a nearly blank slate rather than having to remove and dispose of a bunch of shelving units that would have come with a Fed-ex van or other vans we looked at. We love our new big blue van! And we can’t wait to convert it into a tiny home on wheels over the next few months.